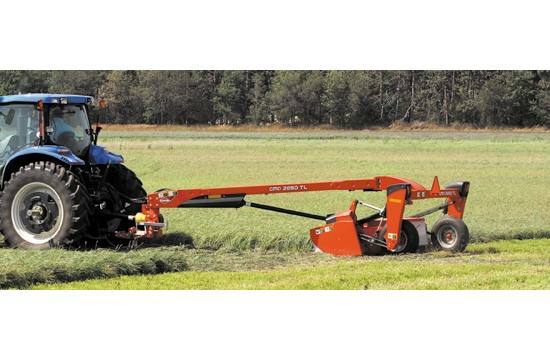 The Kuhn GMD 2850 TL trailed disc mower is designed primarily for hay producers who prefer the benefits of a trailed disc mower, but require a machine that will fit through narrow gates and passageways. It has a working width of 8' 10" and maintains the same features and benefits of the larger models in the GMD TL Series, which offers high working rates, simple adjustments and low maintenance, for dependable grass and forage harvesting. These trailed mowers provide easier tractor attachment as well as cutterbar flotation and contour following, compared to fully-mounted models. The trailed design also lowers the tractor ballast requirement, allowing use with smaller tractors, while maintaining excellent stability both at work and in transport. These mowers are the logical, practical alternative to mounted disc mower and “caddy" combinations. Get quality and reliability, along with outstanding support and maximum resale value, from the pioneer in disc mower technology and the world’s leading implement manufacturer. Working width: 8 ft.10 in. Transport width: 8 ft.10 in. Average swath width: 5 ft.8 in.